Today is Memorial Day in the United States. That's a day when we're supposed to honor people who served in the military, but mostly we have cook outs and sales in stores. I slept in (for me) and got up to read the newspaper on the front porch. Then I dressed for my morning run. The wind had picked up a little by then and the leaves were whispering as if they were already falling raindrops. I shook Earl awake and asked if he'd put the top up on the convertible. It's a two-person job now that the motor has burned out on the convertible top. He said he had and rolled over to go back to sleep. I headed out into the humid morning to enjoy the breezes sweeping along. I'd run more than a mile and a half before the first raindrops struck me. I'd been hearing a sound that could have been far away thunder or might have been an airplane or loud truck. Who was I to judge? I was just coming out of a cul de sac that I run for an extra half mile when the sky opened and the rain fell in torrents. Still, a little rain is no big deal. I'd worn my running cap and it kept the rain off my face. Then from behind me, a loud boom made me jump. The thunder, followed by a streak of lightning, was so loud and close that it set off car alarms. I paused, wondering what to do. Should I move onto the sidewalk and stay under the trees? I know, I know, I should never stand under a tree during a thunder storm, but I didn't want to run in the middle of the road away from the trees either. There were a couple of friends' houses not too far away. The one who was closest would still be asleep. The other was three blocks away, and she might be awake. If not, she had a large front porch that could shelter me. I started to sprint (for me) running hard down the sidewalk. The safety of my friend's porch was within three blocks. After two blocks of sprinting, I could feel my heart pounding. I was going to have to slow down or walk, I thought. Another bolt of lightning followed by booming thunder urged me to keep going. And I thought about the Harry Potter and the Goblet of Fire movie I'd watched the night before when he was ready to give up underwater and gave one last blast to pull himself to the surface. "Ascendio!" I shouted in my head and I made my legs keep pumping. I reached the porch and peered in the doorway. Anne had just gotten up. Wearing a pink sleep shirt, she let me in and gave me a towel. I was still about a mile from home. My slumbering husband was rousted from bed to fetch me, and he grumbled about it all the way home through the standing water on the road and the claps of thunder above. Dream Girl had her second dose of chemotherapy on Thursday. Then she met us on Saturday morning for our 7.5 mile run. "What?" you say. I know. I feel the same way. She doesn't think she is amazing, but she inspires me. I would be one of those women who stayed in bed expecting people to wait on me. I'd be like, "I have Cancer!!!" Her luxuriant brown hair has hung in there pretty well. Two weeks after the first chemotherapy session, as she prepared for the next one, her hair began to fall out. "I'd been feeling the gentle touches on my arms and shoulders as my beautiful hair leaves me, just like autumn leaves falling gently from the trees to the ground. But just like the trees and their leaves, my beautiful hair will return in time." So, on Friday, the day after her second chemotherapy treatment, her friends gathered to help her shave her head. She still has stubble that comes out in clumps if she pulls on it and she still has eyebrows which, she says, makes a difference. I can't believe how gorgeous she is without hair. She feels comfortable like this -- Demi Moore as G.I. Jane or Natalie Portman in V for Vendetta. This morning Grace headed off to her final day of school. When I look at the picture of her first day of school and see how much she has changed...well, she hasnt' really. She's the same height she was when she began school. Grace started to school as a sophomore and has faithfully (for the most part) attended school for three years. She's packed a lot into those three years, and was crying again just last night that she isn't ready for it to end. She's been in four school plays. She's been in choir and Singers (glee club). She was high point winner on her swim team all three years. She has canoed and gone caving. She's been a camp counselor for the fifth graders. She's made friends and even a few enemies. I think she would consider it a success, even if there are things she might have changed. And when she walks across the stage to get her diploma, we'll cheer as if she had slogged through 12 years of school. Being a mom means walking a careful tightrope. 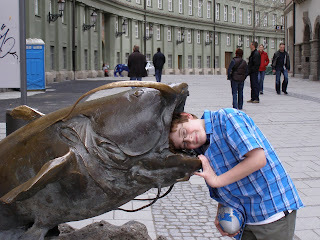 I need to give my kids enough room to try new things and fail or succeed, but keep them alive and healthy. It's tricky sometimes. Last week I wrote about my dilemma as to whether I should allow Spencer and some other 16-year-olds to camp alone in the country. I opted to keep him home. That's why I was reluctant to say no again on Sunday when he and three other guys decided to go swimming at the quarry. My kids had never been to the quarry since we moved here three years ago. The old marble quarry is surrounded by townhouses and apartments now. I don't know if signs forbid swimming. I do know there are supposed to be freshwater jellyfish there. Spencer explained that there is a sandy beach and that they would swim around beneath the rocks before they did any jumping or diving in to make sure it was clear of underwater rocks. Spencer is also a lifeguard, so, even though I was reluctant, I let him go. I have to admit that I called his phone a few times before he walked in the door in his swim trunks, no shirt and flip flops. He was home safely with stories of swimming out to rocks far into the quarry. He'd taken the risk and he was home. I wiped the sweat from my brow. Now, two nights later, we're flipping between Glee and the NBA playoffs when my editor husband texts me. A teenager from a neighboring suburb has died in the quarry tonight. He is a football player and was swimming with other football players. I don't know the details. I don't know if they were rough housing or trying to see who could try to reach the bottom of the quarry. I don't know if they were diving off cliffs and hit a rock. I don't know if he was a weak swimmer who couldn't make it back. I do know that it feels too close, like one of my feet slipped from the tightrope and I had to reel my arms like windmills to regain my balance, checking to see that they were all safe. And I can't imagine how that other mother feels. It's so hard to let them take risks when anything could happen when they walk out the door. What's that? You don't get up and bake homemade cookies for your children's school lunches everyday? Oh, dear. What would June Cleaver think? Some people may take the opportunity of an unscheduled day to spend it sleeping in then lolling about for the whole day. Others might organize a spring cleaning day. For me, I decided on a family road trip. My grandmother lives four hours away in southern Kentucky. She's 92 years old and has out lived two husbands. She has a pacemaker and until a few weeks ago, she was caring for an aunt who is in a wheelchair. 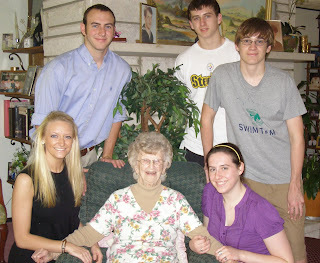 When they moved the aunt out, I knew that it was true, my grandmother, who I call Nana, is starting to slow down. Taking care of other people has been her life so if she decides she can't take care of other people, that is serious. So following a winter where she slipped on the ice and broke a vertebrae and a spell a few weeks ago where she had a small stroke, but drove herself to the doctor because she didn't want to bother those nice ambulance drivers, I decided it was time for my whole family to pay her a visit. Grace and I had seen her in April when we drove to Florida and back. Nana mentioned that she wouldn't even recognize my boys because she hadn't seen them for so long. I thought that might be true. So we left the house about 7:45 with chocolate milks and little powdered donuts to lure the teenagers to the car. We listened to the first CD of The Lion, The Witch and the Wardrobe trying to retrieve that old Narnia magic on a car road trip. Then we turned to telling stories and playing 20 questions. Finally, we fell back on Harry Potter story CDs. Harry Potter with the soothing voice of Jim Dale has gotten us through every car trip in the past 10 years. We surprised Nana because I didn't want her trying to prepare food and wearing herself out. She was delighted to see us, even if she kept calling Spencer and Tucker by the wrong name. And, although our day was unscheduled, my cousin Mike, who lives nearby, has a family that is always scheduled. He and his wife Melinda (one of the best additions to our family) had a funeral to go to and their college-aged children had a wedding to go to, but they still made time to visit us at Nana's house. My kids and his kids used to spend hours playing dress up and exploring the gorge and cave over the cliff from Nana's house. They'd gather weeds and berries and make potions. They were imaginative and daring, playing Little House on the Prairie. So it was good to have a reunion, even though no one played dress up, except Morgan who needed to change from her funeral dress to one appropriate to celebrate a sorority sister's wedding. Then my Uncle Wil came by to borrow some pruning sheers, having misplaced two pairs of his own. It was practically a family reunion. I patted Nana's arm before we left and implored her to take care of herself. "Honey, that's all I have to do now," she said. And I wondered whether that means she is giving up just a little. She has always had someone else to take care of. She seemed well, just admitted to getting dizzy if she stands or walks too much. So she has slowed down a lot. As the afternoon grew long, we piled into the car to drive back to Ohio and allow the kids to scatter with their friends. They took car pictures and slept. Then listened to some more Harry Potter as we reached Columbus before the sun had gone down. No one complained about a day spent appeasing mom. No one even fought about summer jobs or swim team practices. And Earl's tool bag, which he'd taken along just in case Nana needed some work done, remained in the car. We have the absolute worst dishwasher in the world. And I'm not talking about myself. When we bought this house with its totally redone kitchen, granite countertops, cabinets with the roll out shelves and all stainless steel appliances, we thought our kitchen worries were over. I remember my friends joining me that first day in the kitchen. We pulled open the dishwasher and looked at the wide expanse of the top and bottom racks. "That's great," Laura had gushed. Without specific places for glasses, bowls or plates, we could stack things wherever we pleased. Until tall glasses began to fall over and bowls tipped on the wrong side like turtles on their backs. Not so great, I admitted to Laura after a few weeks. Then we realized the dishwasher was not doing a good job at actually cleaning the dishes. I mean, that is its purpose. "We're probably filling it too full," Earl suggested. So we put fewer dishes in it. It has no heating element, so the dishes are always wet when we open it. "Just trying to save energy for us," I'd think as I pulled out a dish towel to dry the sometimes clean dishes before putting them away. When it still wasn't cleaning well, Earl read the directions carefully. "Here's the problem. It needs dishwasher salt." Of course. Why didn't I think of that? Because who knew dishwashers needed salt? "Well, it's Italian made," he explained, as if that told me something about why my sucky dishwasher didn't actually wash dishes. He ordered special salt for the dishwahser. Still dishes with films or apparently untouched by the water sprays. The soap holder no longer opened so we'd just toss the detergent in there. We tried different detergents with extra rinses and extra cleaners. To no avail. Earl continued to work on improvements. He'd clean the trap, wondering how so much food ended up in there when we were practically hand washing the dishes before we put them in the dishwasher. He started cleaning out the inside of the dishwasher weekly. I kept a bottle of bleach and water and would spray down the inside, seeing the mildew that was forming inside the dishwasher? What kind of dishwasher gets moldy on the inside? I started spraying the bleach water into the spray arms then wiping out the mildew that seemed to have gathered there. Earl took the bottom rack to the backyard and used a hose to dislodge the thick black mildew that had formed around the underside of the wheels. I sprayed more bleach water and ran the dishwasher empty. Today when I got home, he told me that he had dislodged the two spray arms and taken them out back to hose them down. He described what he found as "ribbons of mildew." That makes me gag. We've been eating and drinking off dishes that were daily being doused with mildew-laden water. To all my friends and family who have ever eaten at my house, I apologize for the potential poisoning you received. 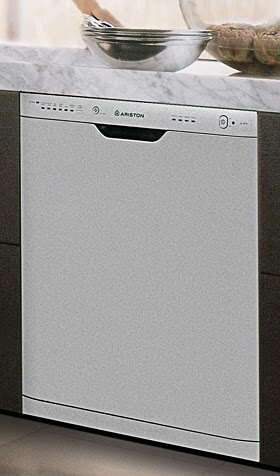 I can only hope the mold changed to penicillin in your body and warn you never -- never, never, ever -- to buy a dishwasher from the Italian company Ariston. Some of you may be saying that I obviously need to buy a new dishwasher. And I would agree with you, if I didn't have a small $18,000 college bill waiting for me in August. So, I guess it's back to the olden days and handwashing my dishes. I just love my periodontist Dr. Sakamoto. Well, I don't love having to visit him, but he always tells interesting stories, like the friend who gave him an iPad because he did a guest lecture for him. I read somewhere that the biggest beauty tip to help women look young is to preserve their teeth. Losing a tooth is devastating to the bones in the face. That's why I was worried when I started to feel pressure on a tooth when I would bite into something. Guess which tooth? A front one of course. I went to the dentist and he saw a lot of bone loss, but only in that one tooth. He couldn't figure it out. That's why I went to Dr. Sakamoto. He agreed with my dentist that the one tooth, well, about half of that tooth, had bone loss. He doesn't know why and guesses it must have been an injury somewhere in my past. The rest of my teeth are fine. So he came up with a plan to clean out the area under the gum and pack it with cadaver (that's right, I said cadaver -- dead people) bone to see if he could regraft it to the bone. And that's what he did yesterday. I'd been taking 800 mg of Motrin for 24 hours. He said that helps with the swelling and the pain. I'm not a wimp about pain. I had two of my kids natural. And I hate really heavy duty pain medicines, like vicodin. So Dr. Sakomoto numbed me, told me the iPad story, talked about the touch pad benefits and drawbacks. Then (WARNING: this may gross you out because it still gives me shivers) he basically split open my gum and started scraping like mad on the bone there. It reminded me of when my nose was broken 20 years ago and they had to pull the bones apart to try to get them back together straight. That scraping noise from inside my head...ugh. But it didn't hurt. I just felt the pressure and that scrape of metal on bone. I did kind of wonder if Dr. Sakomoto had a plan because he seemed to be going at the scraping with great gusto. Then Dr. Sakomoto gave me stitches to hold my gum in place. They are lovely long black stitches above my front tooth. He told me that he tied the knots on the back side of my teeth because no one wants black knots on the front of their gums. He neglected to mention the long black stitches on the front. And I couldn't really see them until my mouth was un-numb again. Here's a funny thing. They told me not to workout the day after and then do only a half workout on Friday if I felt like it. So I asked about my usual run on Saturday with my friends. We run about 7 and a half miles. The nurse was skeptical about that. "If you're feeling light-headed at all...."
So I have gum surgery and I should skip my run, but my friend Dream Girl has a lumpectomy and a drainage tube but she can run? She has chemotherapy two days before, but she can run? This seems like a lame excuse to skip my run this weekend. Maybe I'll take my roller blades! Grace's high school graduation is quickly approaching. Two weeks, don't remind her, she says as she clings to her childhood. I think she pictures us kicking her out the door when she graduates, but really, we plan to wait until August when she goes to college. To celebrate her graduation, we're having an Open House, which basically means people are welcome to come and go as they please on the Saturday afternoon before her graduation. We chose that time because my parents will be in town from Florida for the graduation, and my brother in Dayton will be able to come up on the weekend. I already feel bad that she said each family gets 8 tickets for graduation and I said we only need six. Earl and me, the boys and my parents. Really, who else do you invite to sit through the graduation? I want to make the graduation party fun. I was thinking of different food ideas. Traditional grad party food would be platters of lunch meat with buns for sandwiches, along with vegetable trays and fruit. Then I thought we could do shish kabobs. Then I had a stroke of genius. Grace at one point had said she wanted many kinds of cake at her graduation party. The memory came back to me, and since it is in the middle of the afternoon anyway, I decided on an all cake party. Thus, the theme, "Let them eat cake," that and the fact that Grace is a little bit like a queen and she loves royalty. My friend Ruth may come down the day before to help me bake cakes. I want to have at least 10 different kinds. Some choices are easy. 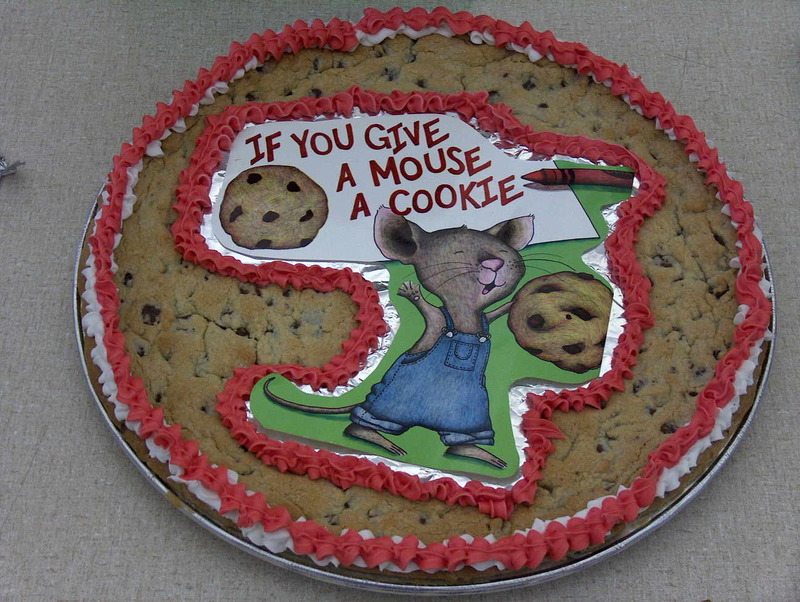 I'll order cookie cakes that look something like this but say "Congratulations Grace" rather than If you give a mouse a cookie. 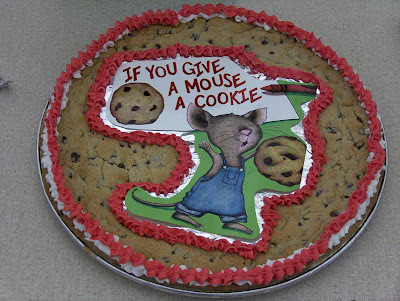 I'll also order an ice cream cake, but I won't really be able to set that out on the table with the other cakes. Then I'll bake some favorites. Turtle cake is similar to the turtle candy. It is chocolate cake with caramel and chocolate in the middle. I skip the nuts. Cola cake is a southern favorite here in the U.S. It has Coke, as the name implies and marshmallows in it. It is one of the moistest chocolate cakes I've ever had. I also have a great recipe for carrot cake that includes crushed pineapple and yogurt. I experimented with a Pineapple Upside Down Cake the other day. It was gone pretty quickly. I'd never made one, but it was easy and delicious. What's not to like with all that butter and brown sugar. Now, I'm stumped. I need some more great cake recipes. Does anyone have any suggestions? That's what my 16-year-old son is calling me. He thinks it's ridiculous that I won't let him go along with five of his buddies for a weekend at a friend's trailer in the Hocking Hills. Hocking Hills is a beautiful area about an hour and a half from here, where the Appalachian Mountains think about starting. The hills start to roll and they're covered with an expanse of forests. We've gone there many times as a family. His friend Riley's family owns a trailer somewhere in the Hocking Hills, and these 16-year-olds, who are becoming newly independent, think it would be "epic" to go down there for the weekend. They'd build a campfire and roast hot dogs. They'd cut their own wood with an ax. What could possibly go wrong? Let's start with the drive down there, I suggest. Who plans to drive you all? He lists two friends who have their license and access to a car. Two 16 year old boys driving a carful of friends onto those curvy, country roads. Disaster right there. Aside from the fact that Ohio has a law that 16-year-olds are only allowed to drive one other person in the car, I would not trust a 16-year-old to drive that far away. Then there is the group of boys sitting around a campfire with access to knives and axes. Can't you just picture the way they would begin to dare each other to do things? I can't even come up with the ludicrous kinds of games they would invent after watching weeks of "Deadliest Warrior" -- whether they'd be playing an innocent game of William Tell and shooting apples off each other's heads or trying hatchet throwing games. Sixteen-year-old boys in a big group don't always make the best decisions. They also aren't good at resisting the suggestions of the rest of the group. What happens when one of them decides they need to go on a beer run? Has the driver already been drinking when they pile into the car in the dark on those twisty roads? "Mom, would probably wouldn't even drink beer," Spence said to me. Then realized what he had said. Do they leave behind the campfire they built and consequently start a forest fire? See, they could do more than just hurt each other. "But you said I could," he lied. "I said you could go if Riley's dad went and drove," I corrected him. I can't believe the other boys' parents are okay with this. Some of the boys' parents I don't know very well, so maybe they are letting their sons go. Or maybe this is just boy talk about what they'd like to do and none of the parents are okay with it. I suppose in two years he'll be going off to college and I won't be able to control who he drives off into the mountains with. But maybe something magical happens in those two years and his decisions become much more measured. What do you think? Am I being overprotective or should I stick to my decision? I have a friend who now goes by the name of Dream Girl. I'm not sure why she called herself that because she is currently making her dreams come true instead of just dreaming about them. I met her this morning at 6 a.m. for a 7 1/2 mile run before she was off to class to be a teacher for special needs students. She finished her first chemotherapy treatment on Thursday. 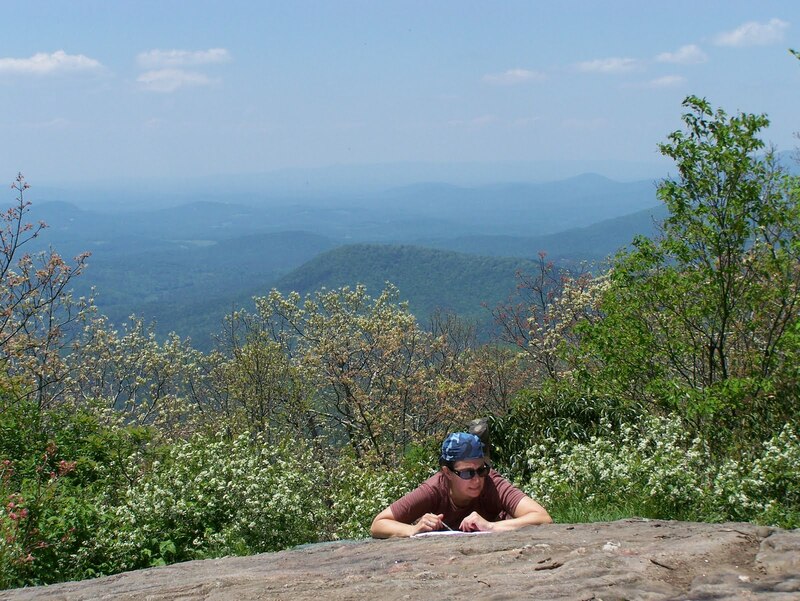 Last week, she went hiking on the Appalachian Trail. We've gone twice before to do small sections. This time, she went to Springer Mountain, the southern end of the trail and began hiking. 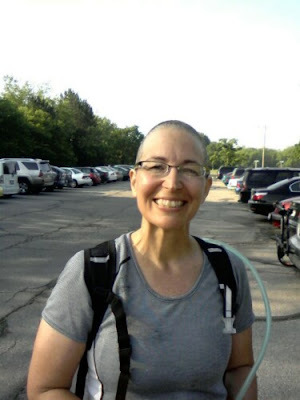 She had just recovered enough from the lumpectomy, that removed cancer from her breast and lymph nodes, in time to carry a pack on the trail. She had to schedule the hike carefully so it could fall between the surgery and the chemotherapy. During our run with the Queen of Anonymity, Dream Girl regaled us with tales from the trail. The weather was perfect, almost too hot. They saw clothes and food discarded along the start of the trail as hikers tried to lighten the load of their packs. On our run this morning, we saw four deer, a racoon, squirrels and birds of all sorts. I felt like I was in a Cinderella movie the way the animals seemed drawn to us. That's the effect that Dream Girl has on nature though. It comes to her. Dream Girl has a long way to go -- seven more weeks of chemotherapy. She'll lose her shiny brown hair. She plans to keep running with us each week and she's going to start lifting weights again now that she has recovered from surgery and can raise her arms up over her head. Being fit and healthy is something she's fought for and she isn't going to let it go. Maybe she's being optimistic, and maybe her trail name "Dream Girl" does apply to this situation. Whatever I can do to help her dreams come true, I'll do. That may not make me a "Dreamgiver" but I'll definitely work on becoming a "Dream Enabler." Actually, she doesn't need much help. She seems intent on creating her own happy ending. I was making school lunches the other morning -- a job I loathe even though I've only done it for three years -- when I suddenly remembered that next year I'd only have to pack two lunches. Grace would be gone to college so I'd only pack for the boys. I perked up at the thought of buying one box of drinks that lasted the whole week. Three kids, five days a week -- that's 15 drinks. Whereas two kids... well, you do the math. Then this week Grace is gone as a counselor at 5th grade camp. I'm packing two lunches in the morning for the boys, but I miss Grace. And that's when I realized that with packing lunches and so many other things, I'm anxious to get on to the next step. I want to put this stage behind me, put a big check mark next to it and move on. When the kids were little we had boxes and boxes of hand-me-down clothes. We were lucky to have so many clothes for the kids, but I hated all the clutter from the boxes. The boys clothes came from my brothers' sons and the girl clothes came from Earl's sisters' daughters. I separated them according to size and when the youngest reached that size, I could throw out the box crowding the attic. I couldn't wait to get rid of all those big boxes. It wasn't until later that I realized how I was rushing through the kids' childhoods because I wanted to get rid of boxes of hand-me-downs. I wonder what else I am sprinting through, not taking the time to enjoy, anxious to clean up and finish? Because, I have to tell you that this week, with Grace gone and only fixing two lunches, I'm not really using that extra time wisely. It's not like I take the time I saved and work on the the great American novel. Another game of gem drop anybody? When our French friend Marie visited, we found out that things we take for granted are really foreign in other countries. She was flabbergasted to learn that high schools actually had musicals. She couldn't believe that marching bands actually existed. I'm not sure what she would have said about prom. So, how to explain prom to those who aren't familiar with it. It's a dance - a formal dance for juniors and seniors in high school. That means most of them are 17 or 18, but they can invite the younger high schoolers.. The kids get dressed up. The girls have manicures and sometimes pedicures and sometimes up-dos for their hair. Some groups of kids will rent limousines and travel to prom in style. All the better to drink and not get caught drunk driving. But those were the kinds of things I thought about during prom. Here's a picture of Grace and me, her short mother, without a fancy dress or an up-do. Her dress was fairly risque, but she loved it and she looked gorgeous. Grace and her date went to prom with a fairly innocent group. Her date Sean is a very nice guy who she knew she could count on to dance. A lot of high school guys are uncomfortable dancing. And the best thing about Sean is that he is 6-feet, 3-inches tall, so Grace could wear heels and not tower over him. You can see from this group picture that she and Sean are by far the tallest. After the parents insisted on interminable pictures, the group went to dinner at Buca di Beppa then to the dance. According to Grace, the music wasn't great and there were way too many slow songs rather than dance songs. After prom ends at midnight, they all go to afterprom, which was held at the Ohio State rec center. It includes basketball courts and big fields of turf, a climbing wall, movie rooms, and a place for card games. Those are the things I know about. The kids stayed there until 3:30 a.m. Then they all went to a friend's house and crashed on couches and chairs and the floors. They fixed breakfast this morning -- bacon pancakes, and some of them still appeared perky after so little sleep, and a little ice cream cake to give them a sugar rush. Of course, our expectations were low. We were coming home to a house with three teenagers who had been, for the most part, home alone for more than a week. Their aunt, 10 minutes away, was ultimately responsible for them and she did more than her share of calling and calming and checking for broken bones. The kids though opted to stay home rather than sleeping at her house everynight. All things considered, everyone was alive and healthy. The house smelled slightly musty, with the tinge of molded bread coming from the cabinets and overripe fruit emanating from the trash can. The living room was picked up. One side of the sink was free of dishes. Truthfully, they did a splendid job of surviving. Surviving is so different from thriving though, isn't it? The little things were missing. For instance, the kleenex box on the back of the toilet was empty. No one had thought to recycle it, much less replace it with a clean one. The same hand towel that I put out before we left lay slumped on the bathroom counter. The shower held no soap, but a bottle of shower gel looked like it had seen some use. The laundry had piled up and the dishwasher was rarely used because I'd set out a stack of paper plates and cups. I figured it was better than expecting them to do dishes everyday. Grace had stayed home sick one day with a cold and Spencer had been sent home bloody one day after he fell playing basketball at lunch. The fights between the kids were minimal and the police were never called. Overall, a success I think. If they're a little grumpy, a little clingy now, well, that's the price I pay for my nine glorious days in France. We made things harder on our travel schedule by going to Nantes to visit friends. Of course, we loved seeing them and spending time with them, but the trip home was brutal. We didn't sleep well the night before, checking the alarm clock to make sure we caught the 7:30 train. We took the TGV to Paris Montparnasse. That's a 2 hour, 15 minute trip. Once there, we found a bus that goes directly to Charles de Gaulle airport, known as Roissy, I don't know why. The bus makes one more stop at the Gare Lyon before heading to the airport and we were cramped into those tiny seats for more than an hour. Why didn't we take the Metro, we wondered after paying 33 Euro for the long bus ride. The metro stops farther away from the terminals and we'd have to walk, but that might have been preferable to sitting on the bus for all that time. Poor Earl, his knees jammed against the seat in front of him again. Once we checked our baggage and waited in line through security, we walked past shops searching for the correct gate. "Let's get through, put our stuff down and go back to get coffee," I suggested. Earl agreed. We hadn't had breakfast, still stuffed from our meal the night before of white asparagus in vinaigrette, scallops in a cream fresh sauce, four kinds of cheese and a bakery gateau called Trinidad with mango between the chocolate layers. We saw our gate at the end of the terminal and found another security line for those passengers going to the U.S. We didn't realize that once checked through the special isolation security, we weren't allowed to leave again. I asked the security guard if we couldn't go back into the terminal to get coffee. "There was plenty of time for that," she said in French, but this time I understood her. I felt like a chastised child. We had hurried to the gate, two hours before the flight, and now we would sit and suffer. We had a water bottle, a pack of cookies and some edible gifts for the kids. We were tempted to dig into those. I also had no book to read. I had planned to buy one in the terminal since I'd read the two we brought along. I did have a Sudoku book and my computer. I couldn't get on the internet because it required a special password (Detroit's airport didn't, Paris' did). I played some lame games that came on my computer while waiting and waiting and waiting. And then the flight home. It's nine hours from Paris to Detroit. Our flight was scheduled to leave Paris at 1:30 (Paris time) and get to Detroit at 4:30 (Detroit time). It's all day time and we didn't sleep. We waited on the tarmac for an hour so left at 2:30 and arrived at 5:30. Air France has little television screens in the seat back so each passenger can choose his/her viewing pleasure. This helps to pass the time, but nine hours of television? Even watching the screen follow the flight as it goes over the UK and Iceland can seem exciting after five hours or so. We both felt like we'd fallen out of love with Air France on this voyage. Before, we were always willing to pay a little more to travel Air France. Traveling on Air France versus, say, Northwestern was like having dinner in a restaurant in Paris versus a dinner in Columbus. There was a little more attention to detail. The food definitely made a difference. The seats seemed a little roomier. On both flights this time, it seemed like a cattle call. Boarding was just "Okay everyone with a ticket can now board." Are you kidding me? So next time, and I'm sure there will be a next time, we'll choose the best deal, unless we can get an upgrade with extra leg room for Earl. We had been travelling 22 hours when we finally arrived home and surprisingly found all three kids home, for a little while anyway. We've found our share of the whimsical and bizarre in France and I didn't want you to miss it. I loved this display in Montmartre of bottles filled with (I'm imagining) a sugary liquid. Each bottle lists its flavor. Citron, mandarin, cassis, violette, menthe, peche abricot, lavande... It doesn't seem to be alcohol. I should have bought one. Or several. Also in Montmarte was a shop that made every day kitchen appliances into fanciful characters. Here's a small grater. Can't you just picture holding onto her blonde head while you grate a hard chunk of parmesan? And here's a larger one. Very elegant for a grater, dont you think? I'm imagining what her dress might look like covered with slivers of grated carrot. No, maybe cheese is more her color. This same shop also had minute timers that looked like big-eyed owls. I imagine they help while away the minutes for a child's time out or a simmering sauce as their beaks count down the time. In Nantes, we saw a candy shop that carried what looked, to us, like homemade peeps. They were big and fluffy and covered with colored sugar. We didn't try any. The whole window was filled with the concoctions in every shape and color. It made my teeth hurt just thinking of them. Near Les Halles one morning, as we were killing time because we had missed our train, we found a shop that made me look once then twice before realizing what it was. The photo is very reflective, so you'll have to look hard to see what I saw. That's right. It's a window full of dead rats hung from traps. This place was an exterminator business. The saddest thing is that right next door is a bakery. I imagine the bakery was not thrilled to be next to a window full of dead rats. Scarves and the French go together like peanut butter and jelly, like caviar and champagne. This year, scarves have had an upsurge in the US too. And how many people turn to Youtube in search of different ways to wear their scarves? That's why I tried to find pictures of women wearing their scarves in various ways, as an example to you, my readers. A loose wrap around the neck is one of the most popular scarf looks. Not too tight around the neck though. The tighter the scarf, the more repressed and high strung you'll seem (that part is my interpretation of it). Another common scarf tie is the double over and pull it through. Women in the US have caught onto this one and you see see it everywhere now. The pull through again can be loose or tight. It can also be male or female. I know, I know, the whole men wearing scarves things seems so French, but I've seen some guys wearing them on the college campus where I teach, so it could happen. Men seem to limit themselves to the two basic scarf ties -- either the loop around the neck or the double and pull through. I didn't see any men with elaborate scarf tyings. Past the common tyings, things get a little more elaborate. The most I can tell you is that there's a lot of looping and knotting. I'd see women check themselves in the reflection of windows and stop to tie one more knot in the scarf. Apparently, the knotting can continue indefinitely. A small silk scarf can work too. Just slim it into a long band and wrap then knot. Spend a few minutes smoothing those ends so that they flare out to add some bulk. The scarf can be used as a simple tool to stay warm. Then it has to be spread out and draped across the upper body and shoulders before a jaunty flip over the shoulder. I also liked this draped look, where the ends of the scarf are not visible from the front. I think this might be harder to pull off if you actually have to move rather than sit still. For men who don't think they have the... well, the nerve to pull off a man scarf, the French have a few other fashion options. There is the ubiquitous sweater tied around the shoulders. See it everywhere. Everywhere. In the US, it has a kind of preppy look to it, so don't combine it with sagging jeans, for instance. I don't think those two looks go together. But combine it with a Ralph Lauren polo or a dress shirt without a tie and you should be fine. The most daring, most French look of all for men is the beret. So go ahead and give it a try. Maybe if you don't say anything, they'll think you're actually French. At least to me, that would be a good thing. My French is so bad now that it's painful. I feel like I'm speaking with a totally American accent and I'm not using the correct verbs, and aaaaaargh! There was a time,granted it was 25 years ago, when I could speak French present, passe compose, conditional, future, no problem. 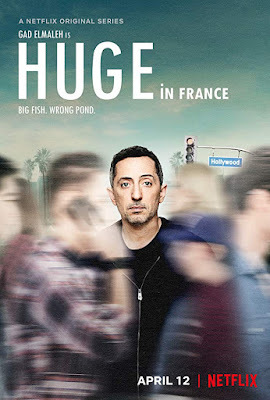 I could even understand the subtleties of some French jokes or plays on words. No longer. I'm fine when I limit myself to ordering in a restaurant or buying souvenir tshirts. I can even request directions and nod my head intelligently when the French person waves her hand, gesticulating this way and that: "A droite et encore a droite..."
But I don't really understand enough to find the place she is pointing out to me. Visiting friends requires a more sophisticated level of French that has so far deserted me at this point. I find myself laughing at stories that are serious and looking sad at jokes! We limit our conversations, which of course limits our friendship. We speak in French and English of all the children and cousins and friends. Trying to catch up on everyone's lives, but always lagging a little behind. I know how to say, "I don't understand" but I don't know how to say, "I just don't get it."